Uber Technologies Inc. is saying it will end a controversial policy of tracking some riders for five minutes after their trip ends. The policy has been under fire since it was introduced last November. An update to the app made then eliminated the option for users to limit data gathering to only when the app is in use, forcing them to choose between letting Uber always collect location data or never collect it. The app’s settings currently let users choose between “never” allowing the app to collect location information or “always” allowing the collection of information anytime the app is running, even in the background. The company believed the feature could help in ensuring customers’ physical safety. Users who didn’t want to be tracked were required to manually enter their pickup location and drop-off addresses, making using the app more inconvenient. The company says that the “always” option will soon change to specify that data collection will stop once a trip ends or is canceled. While Uber asked all of its app users for permission to collect the post-trip location data, it only collected that data from those using Android devices. According to company spokeswoman Melanie Ensign, the company never started collecting the information from users with iPhones and other iOS devices. 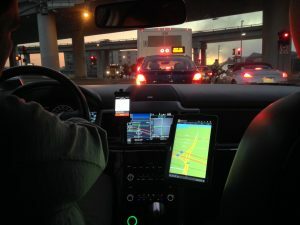 Uber’s new policy for customers using iOS devices says that “there are special circumstances, such as preventing fraud and responding to safety incidents, where Uber may collect background location for any rider in the ‘While Using’ setting.” A notice would appear onscreen in these types of cases. Uber says it is working on making the new privacy option available for devices using the Android operating system as well. Joe Sullivan, Uber’s chief security officer, said Uber was committed to privacy but had suffered from “a lack of expertise” in the area. Sullivan says the recently announced changes are part of a series of updates expected in the coming year to improve the company’s privacy, security and transparency. Sen. Al Franken (D-Minn.) said that he was pleased with the changes Uber is making to increase privacy for its users. He said, “I’m hopeful that this announcement is the first step in Uber’s renewed commitment to the privacy and security of its users.” Sen. Franken has long pressed Uber to strengthen its privacy policies.